New Shared Albums in Keepsafe Photo Vault Give People A Better Way to Secure Photo Sharing Experience with Friends. “Keepsafe Photo Vault’s shared albums give people a protected photo-viewing experience for themselves and people they trust. We set out to make Keepsafe’s photo sharing simple and intuitive, allowing individuals to retain control over their privacy," said Zouhair Belkoura, Keepsafe’s CEO. Keepsafe, the leader in personal space protection, announced new beta functionality to its popular mobile app, Keepsafe Photo Vault. Today, more than 65 million people use Keepsafe for protecting personal digital content, including photos, videos and documents. Keepsafe’s newest capabilities give people the ability to share albums with friends and family while maintaining granular control and privacy in storing and sharing their digital photos. Backed with Keepsafe’s PIN protection and military-grade encryption, new enhancements give people easy precision for sharing pictures and photo albums within social circles. While consumers snap and view millions of photos and videos daily, they don’t always want to share all their digital photos publicly. Increasingly, people of all ages — prefer to be selective about who can see and comment on their photos. In a CNBC survey teenagers cited online privacy as a major concern and revealed they, “actively sought out customizable apps,” that would help them control who saw what they were posting.” And according to insights from a Business Intelligence Digital Trust survey last spring, "when users feel at ease and are confident their privacy is secure, they’re more likely to post, share, or send content that is genuine." Create a shared album for selectively inviting friends and family to view, comment on, and contribute additional photos to the album. Friends invited to a shared album with a single-use invitation code must also set up a pin code on Keepsafe to access the shared album. Private items stored in Keepsafe’s Photo Vault stay private and can’t be shared unless they are moved to a shared album. Spice up your romantic life by sharing pictures with a special someone or two. Your pictures will stay protected since the recipient needs an invitation code and to set up a PIN code on his/her phone to view them. Since no one but a photo’s owner can copy, delete or send a picture, you never need to worry that your privacy will be compromised. Brides-to-be can share wedding dress photos with friends and family without worrying that their grooms-to-be will see them before the big day. Wedding party members can add photos to build out the wedding day picture album and comment on memories as a lasting gift to the newlywed couple. Sharing daily newborn pictures with eager grandparents and relatives without over-sharing with friends and colleagues. Increasingly, consumers are being presented with ‘automated’ functionality or ‘AI’ features that sound cool, but come with big tradeoffs – especially related to privacy. Unlike Google Photos that auto-share pictures with followers by default and may use AI to suggest which photos to share with others, Keepsafe Photo Vault keeps privacy and sharing controls in the hands of individuals. People who use Keepsafe’s Shared Albums feature can decide who to share with and can rest assured that invitations to shared albums stay in their control. 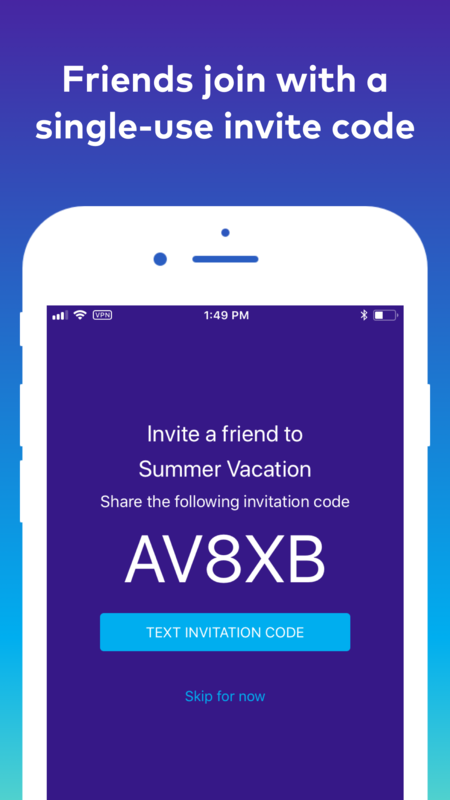 People invited to a shared album must set up a PIN code with the Keepsafe Photo Vault and enter an invitation code before viewing shared pictures. Keepsafe’s new beta functionality mirrors people’s typical photo-sharing practices in the real world. People usually keep the lion’s share of their photos to themselves and selectively share a few of the better ones with specific friends or family. Keepsafe’s new shared photo albums is also an alternative for parents and family members who want to temper their ‘sharenting’ practices (i.e. ; excessively sharing pictures of babies and children on social media). According to a study by AVG, more than 90% of American children already have an online presence before they reach two years of age. Keepsafe Photo Vault is available on both iOS and Android platforms and is offered in free or premium versions. Over 65 million people use Keepsafe's mobile apps like Keepsafe Photo Vault and Keepsafe VPN to protect their personal space. For people who want more control over their privacy, the freedom to be themselves and peace of mind, Keepsafe makes privacy and security simple.